Paralympics London 2012: The ‘superhumans’ or those who have and those who don’t? Leave a Comment on Paralympics London 2012: The ‘superhumans’ or those who have and those who don’t? I did get wrapped up in all the excitement of the Olympics and I think it has been a successful Games for London. As it all draws to a close this will be my last Olympic-orientated post lol! When I saw ‘Meet the superhumans’ posters on buses and billboards around London, I felt a combination of excitement and curiosity because even though, the first official Paralympic Games (meaning ‘parallel to or running alongside the Olympic Games’) commenced on 18th September 1960 in Rome, I did not know much about the individual athletes or the level of impairment classification system. I knew that the Paralympic Games would definitely be inspirational and with 2.4 million out of 2.5 million tickets sold before the Games even started I am not the only one! Becoming a medal winning paralympian does come at a cost (like most things in life) but also financial reward as athletes apparently get money for winning medals. However, the technology, from light-weight wheelchairs to carbon fibre blade-shaped prostheses with socket technology is expensive (Stefanie Reid of Team GB has two blade legs at a cost of £12,000 each; to attach them costs an extra £2,000 annually). Running commentary during the Opening Ceremony touched on how difficult it is for developing countries to compete or even make it to the Paralympics (Botswana and Malawi withdrew their visually impaired teams last minute), having said that Sierra Leone did make their debut this year. During the Opening ceremony Team Ghana strode into the Olympic stadium dressed in African print, led by flag bearer Raphael Nkegbe Botsyo, a wheelchair athlete in the T54 100m. 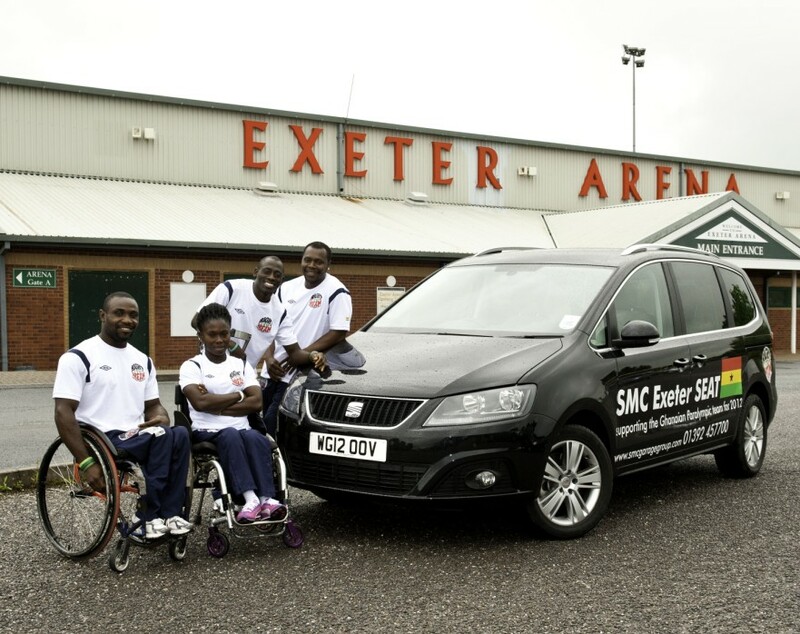 Like many developing countries, the Ghanaian Paralympic team do not have direct access the best sporting equipment / facilities and so came to Exeter University to finish off their preparations. However, steps are being made by charities like Right to Dream in Ghana, who through developing the ‘Right to Dream Paralympic Programme’, have made it possible for the four Ghanaian athletes, Charles Narh Teye (powerlifter), Alem Mumuni (para-cyclist), and wheelchair track athletes Raphael Nkegbe Botsyo and Anita Fordjour to compete this year. Host Adam Hills of ‘The Last Leg’ a daily summary program of the Paralympics on Channel 4, has taken a liking to Team Ghana (#teamghana) and has decided to show his support by painting the Ghanaian flag on his prosthetic leg! You can see the footage from the Saturday’s 1st September show (15 minutes 50 seconds mark). Unfortunately, there are still some negative views towards disabled people in Ghana but Raphael, who had his legs amputated after infection with the poliovirus, is trying to destroy these myths, ‘The truth is that disability can be more in your head than in your body. It is caused by a lack of education and information’. The Last Leg Show invited Raphael to the studio on Sunday 2nd September 2012, and named him their favourite Paralympian. Despite all the great things that I have seen at the Paralympics, I am concerned that it will become elitist, as access to technology in some events will be a determining factor for those who win, and those who can even compete. There are encouraging initiatives to prevent this kind of elitism, with charities like Right to Dream in Ghana and Motivation in Bristol, UK. Motivation provides people in the developing world with wheelchairs while rehabilitating them with sport. Motivation have supplied 50 countries with 4,000 basketball wheelchairs and created a three-wheeled low slug aluminium chair that is on show in the Olympic village during the Paralympic Games. Whatever advantages finance provides I cannot deny that all Paralympic athletes are very inspirational and these Games have changed public perceptions of people with disabilities. ‘It never rains but pours’ (especially in London) and Team GB medals have been pouring in but can they top what they did in Beijing? I have to mention the Irishman – Michael McKillop (Track) T37 1500m and 800m – Michael has cerebral palsy; his astonishing wins have made him the ‘best paralympic middle distance runner in the world’.